For some seniors, the road to better health may seem long and difficult to navigate. However, your elderly loved one can use certain strategies to give his or her health an instant boost with the added bonus of long-term results. The staff at Home Care Assistance, a leading provider of home care in Harrisburg, suggests these activities to help your loved one receive immediate health benefits. Exercise programs often take a long time to show results, yet any type of safe movement can have an immediate benefit for your loved one. Dancing is something your loved one can even do at home, and this type of movement places weight on his or her bones and instantly stimulates the release of calcium. This can help reduce the chances of your loved one developing osteoporosis, and making exercise fun can encourage future physical activity. Fish are packed with healthy omega-3 fatty acids that can enhance your loved one’s health. In addition to the anti-inflammatory benefits, eating fish also enhances cognition. Toss some walnuts into a salad for additional omega-3 fatty acids, and you can maximize this instant health-booster. Caffeine is a diuretic that can rob your loved one’s body of moisture and trigger urinary discomfort. However, drinking water instead can instantly have a hydrating effect. Once this habit is established, your loved one can enjoy healthier skin, better kidney functioning, and increased energy. 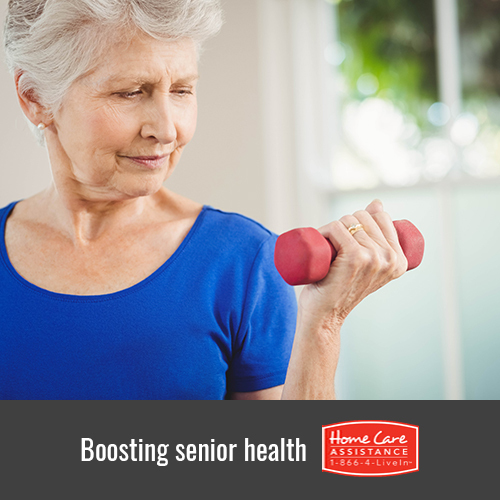 Whether seniors prefer to sit or stand, the way they hold themselves can contribute to pain and injuries. Help your loved one practice standing and sitting with his or her back straight and shoulders relaxed. This can instantly reduce pain while preventing future issues with his or her spine. Laughter truly is the best medicine, and enjoying a good laugh can provide an immediate boost to your loved one’s immune system. Watch a hilarious movie together or invite over one of your loved one’s friends to share some jokes. By making it a point to find the humor in life, your loved one’s mental wellbeing can get a boost as well. Though an instant boost in health can be wonderful, it’s never too early to start thinking about your loved one’s long-term health. If your loved one has an age-related condition that makes everyday activities difficult to accomplish, turn to Home Care Assistance. Our caregivers are available 24/7 to assist with exercise and meal prep, provide social stimulation, and help with many important daily tasks. We also offer comprehensive, stroke, Parkinson’s, and Alzheimer’s care in Harrisburg. For more information on our elderly care services, call one of our friendly Care Managers at (717) 540-4663 to schedule a no-obligation consultation.